If the early story wasn't sufficiently crushing enough to blow Sybil's Cave to smithereens, the utter vapidity and raging ego digs deeper on the way to China. Altering the earlier story to remove the outright defamation is replaced with a hasty attack on Jen Giattino debunked yesterday on twitter by Jason Freeman. It's regurgitated in a desperate bid to change the narrative in TextGate. 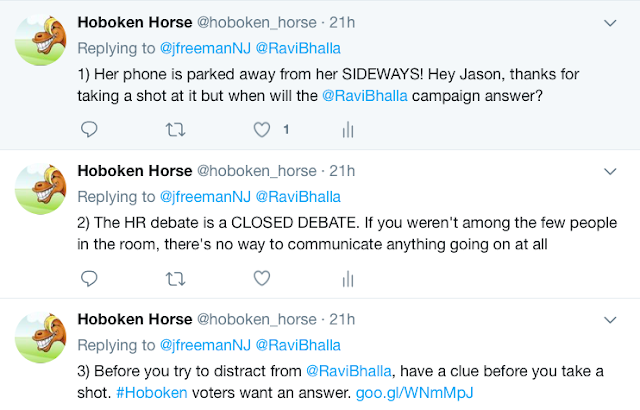 Now the distraction attempts to point to some moral equivalence to the City Council President at the Hudson Reporter mayoral forum. Her phone is seen on the table and this presented as an equivalence to the activity MSV accurately showed depicted on videotape at the Mile Square Theatre. With the desperation this deep, Sybil's Cave will resort to any lie of commission, omission and everything in-between. Anything to avoid making a requested retraction. The answer to that reasonable request was "go to hell." It's this kind of intellectual dishonesty one would expect of a ten year old. Here's the complete exchange yesterday beginning with the Cheatos at question. There's a three part answer and of course the truth is kept hidden at the Cave. Only the first of the three responses is shown. The three part answer ended the conversation about Jen Giattino for obvious reasons as seen below. Talking Ed Note: Mustn't let the cave dwellers see the truth. They're mere fodder for lying manipulation. 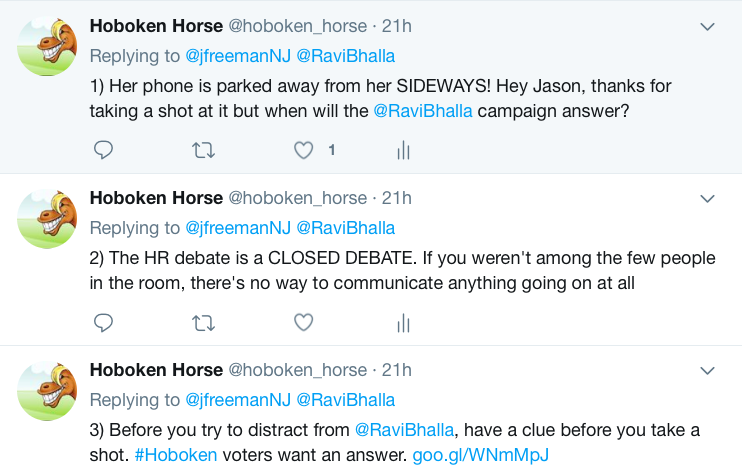 Nancy, repeatedly lying for your candidate makes Ravi Bhalla look bad and what you're doing is unfair to him. Retract and move on. Or keep digging and look more the lying fool.